Dr. Mark Fesen completed his undergraduate work at Rutgers University. After serving as a ward clerk at New York Hospital/Cornell Medical Center, he studied molecular pharmacology at Oral Roberts University before returning to Rutgers University to attend medical school. He completed his internal medicine training at Roger Williams General Hospital/Brown University under Dr. Paul Calabresi. Dr. Fesen is a clinical assistant professor at the University of Kansas and is participating in Phase 2 and 3 Cancer Protocols. 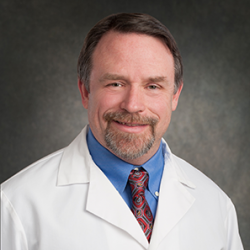 Dr. Fesen is board certified by the American Board of Internal Medicine in Medical Oncology as well as Internal Medicine. He specializes in the diagnosis, treatment and management of all cancer types, leukemias, and lymphomas. We value your personal review. We continually strive to improve the lives and communities of which we serve. Please submit your review here.